There was one story in particular that he told me that was absolutely hilarious. I have laughed at it for years now, and I thought it deserved to be immortalized here for all to see. 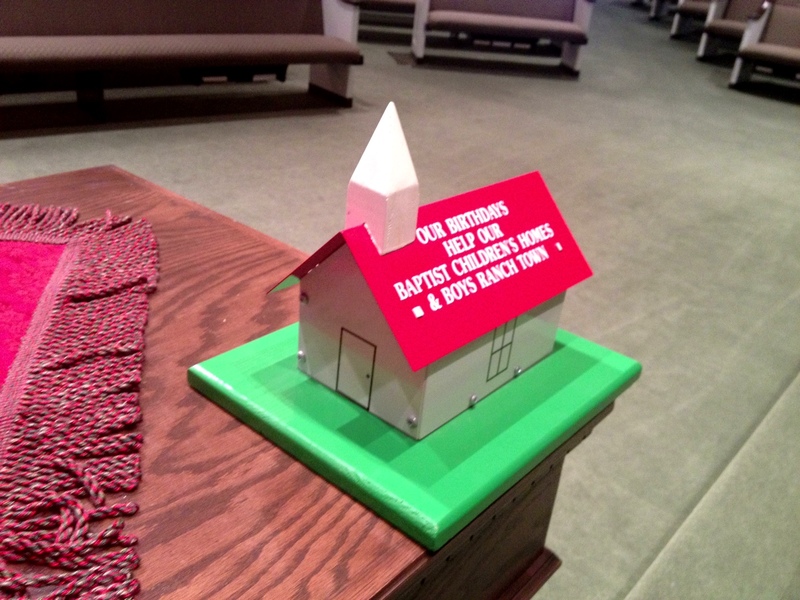 When Pappaw was a young music minister (probably in the 1950’s), his church received a birthday/anniversary offering miniature church similar to the one pictured above. It was the latest trend. He dutifully took it into the sanctuary and placed it on the Lord’s Supper table, replacing the old coffee cup that had originally served in that capacity. The next Sunday, he was dismayed to find the coffee cup back where it had been. He found his new offering church in a closet. And the battle had begun. Round and round he and this nameless, faceless person went, and this quiet battle became a weekly event of hiding and relocating for both sides. After a couple of months of this nonsense, Pappaw decided it was time to get serious about ridding the church of this point of contention. He went into the choir room, searching for the perfect hiding place in which to dispose of the coffee cup. His eyes fell on an old, upright piano that was frequently used during choir rehearsal. A slow smile reached his lips. He quietly removed the back of the piano, placed the coffee cup inside the piano, and refastened the back of the piano in place. He laughed to himself, thinking about how he would never have to see that coffee cup again. The next Sunday came. He went into the sanctuary to prepare for worship. As he was flipping through his hymnal, he casually glanced at the Lord’s Supper table. To his absolute bewilderment and amazement, there sat the coffee cup. To this day, Pappaw still doesn’t know how the person found that coffee cup. He speculates that the person must have been watching him as he was hiding it, but he was under the impression that the church was completely empty at the time of his undercover operation. He also was never made aware of the person with whom he was feuding. My guess is that they’re both giggling about it now in heaven together.